Conversation is the primary way we communicate. It is also one of the most difficult components of social skills for children and adults with pragmatic language issues. Pragmatic language is the social use of language including non-verbal communication, gestures, turn-taking, use of questions, maintaining topic and saying related and appropriate comments. Conversation Builder and Conversation Builder for Teens by Mobile Education Store are helpful in facilitating conversational skills. These apps provide a conversation simulation that is similar to ‘real-life’ and is highly motivating for the students. It gives options for initiating a conversation, responding to someone starting a conversation and maintaining a conversation. It contains photos of believable children and teens while providing visual and spoken options for responses. The students love hearing their voices and playback is easy with the touch of a button. What I would like to see….. 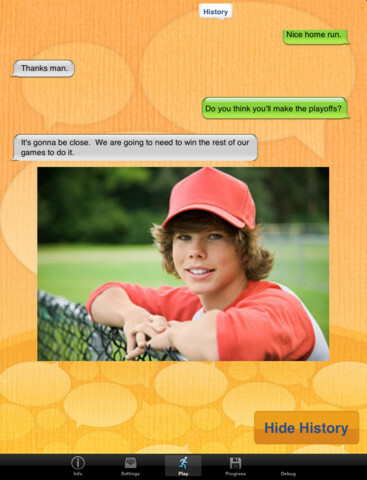 I highly recommend Conversation Builder and Conversation Builder for Teens for parents and professionals. I look forward to more apps from the Mobile Education Store. This app is much easier to interact with on the iPad vs. the iPhone.